At Ever After High™, the teenage sons and daughters of fairytale legends learn they can choose to follow in their parents’ footsteps or discover their own Happily Ever Afters. Ashlynn Ella™, daughter of Cinderella, is an Ever After Royal™ -- she’s chosen her parents’ path. She warms hearts in a spellbinding dress with a floral print on the skirt and bodice inlay. Sheer sleeves and shimmery peplum add royal glam, while her “glass” slippers feature enchanting details. She completes her irresistible outfit with a pink headband, golden jewelry and matching purse with a clock face to keep her mindful of her midnight curfew. 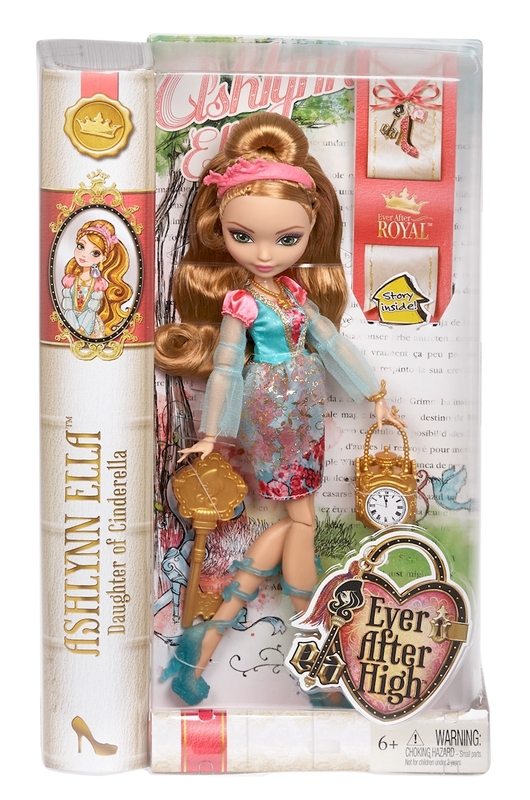 Girls will love recreating scenes or imagining new wonderful adventures for this favorite Ever After High™ character. Ashlynn Ella™ doll also comes with a bookmark that shares her hexclusive story. Collect all of the spellbinding students of Ever After High™ (sold separately) for hexquisite display and storytelling fun. Doll cannot stand alone. Colors and decorations may vary. .